321 MEMBERS. 2,909 HOURS EXCHANGED. Building Community One Hour at a Time! We are working on bringing the New HOPE Time Exchange to life! Please watch for grand opening!!! 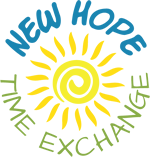 New Hope Time Exchange is a community that is open to all individuals and partners who want to make a difference in the life of others. All individuals are valuable and can contribute to the community in a positive way when they have hope, each other, and recovery capitol. There are many ways we can get involved: Exchange rides, handy man work, arts & crafts, cooking, you can share any trade, skills or talents you may have with other without any money involved, just contribute your time. To become a member complete our application and we will be in touch with you to schedule an orienation with you. We meet the first Monday of the month at 6:00 pm at Parent Support Network of RI Office. Call ahead to rsvp at 401-889-3112.